It's All About The Bass - At Least For Gannets! Home » Outdoor Scotland » It’s All About The Bass Rock! It’s All About The Bass Rock! 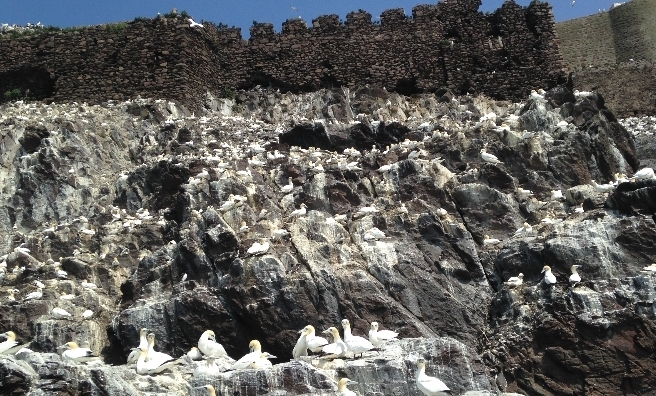 The Bass Rock is officially the world’s largest colony of Northern Gannets. 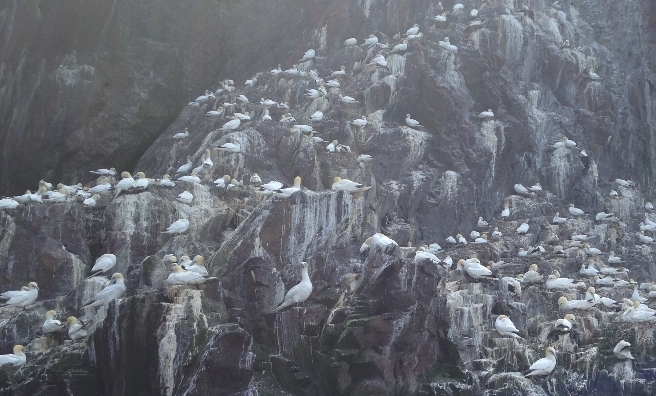 In 2014, independent counts made by Stuart Murray and Mike Harris of the Centre for Ecology & Hydrology (CEH), with advice from Maggie Sheddan, senior Bass Rock guide for the Scottish Seabird Centre in North Berwick, found 75,000 apparently occupied sites on the nearby Bass Rock, an increase of 24% since 2009. 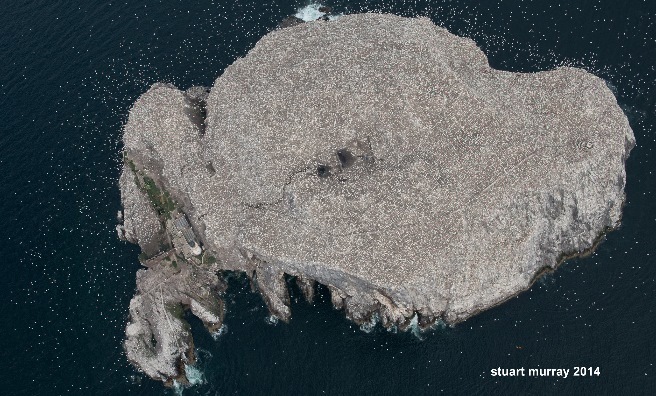 “The colony was photographed from the air on June 23, 2014,” explained Stuart, who was also involved in the 2009 gannet count. “Conditions were excellent, with no wind and a high cover of thick cloud which obscured the sun, reducing the glare from these startlingly white birds. 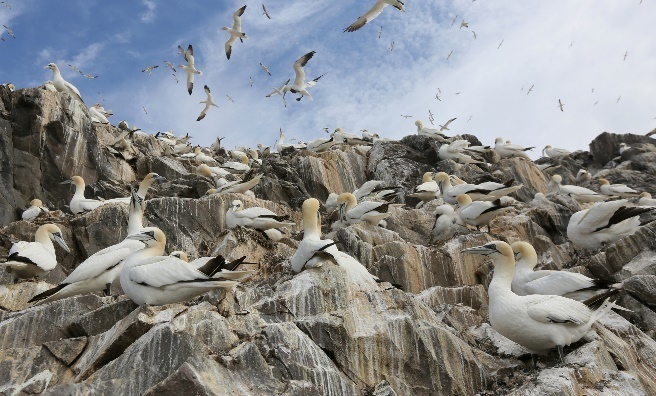 Sarah Wanless, from the Centre for Ecology & Hydrology, said: “It’s particularly heartening to see the gannets doing so well when so many other seabirds in Scotland appear to be in trouble. The Bass Rock is located 2.5m from North Berwick, where The Scottish Seabird Centre inspires people to enjoy, learn about and look after Scotland’s wildlife and, from Easter onwards, runs boat trips to the island. In addition, thanks to live video links and interactive cameras, visitors can watch the birds on the Bass Rock without leaving the Scottish Sea Bird Centre. 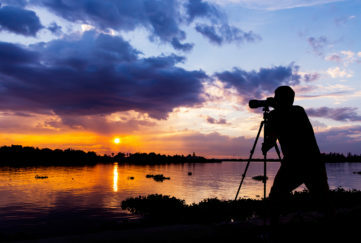 “The figure of 75,000 sites is phenomenal,” said Tom Brock OBE, Chief Executive of the Scottish Seabird Centre. 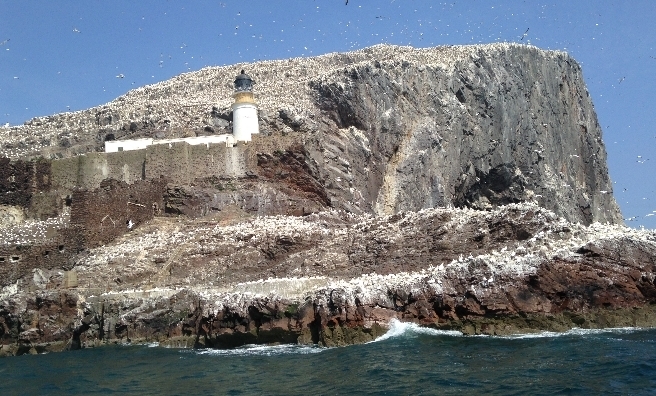 “Every year the Bass Rock turns brilliant white with the sheer number of gannets crammed onto the Rock and not, as some people think, with their guano. 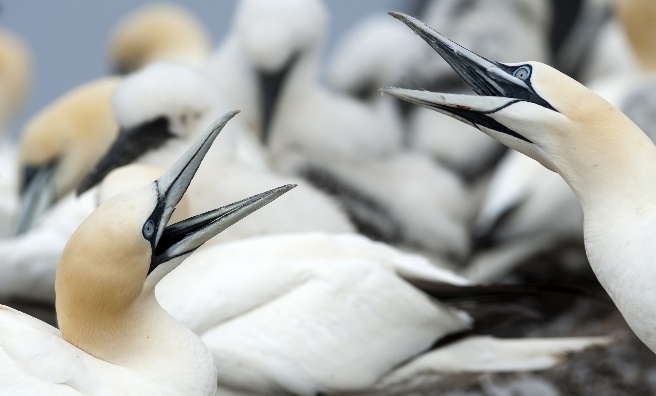 “Yet we cannot ignore the fact that although gannet colonies are currently thriving, other seabird species are not. Gannets are Britain’s largest seabird, with a wing span of over 6ft/ 1.8m and can live for over 30 years, travelling south for winter, many travelling as far as the coast of West Africa, and returning north, to colonies such as the Bass Rock, as the summer months aproach. They have excellent eyesight and can spot schools of fish below the surface of the water – and can dive at speeds of up to 60mph/ 96kmph to catch their tea. 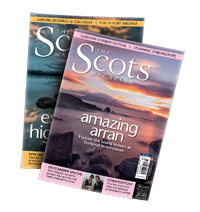 To find out more about Scotland’s wildlife, pick up a copy of this month’s issue of The Scots Magazine. 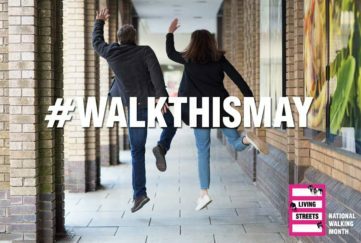 On sale in the shops now or order online by clicking here. Having previously spent hours watching the gannets on the Bass Rock on the webcams in the Scottish Seabird Centre, it was wonderful to be able to sail out to the birds’ home and see them up close. 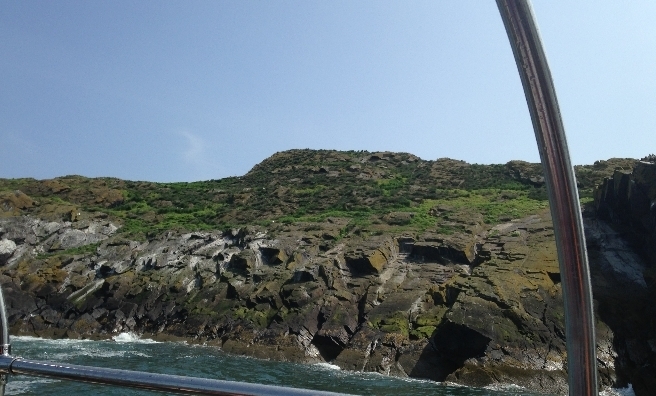 We left North Berwick Harbour in Scottish Sea Bird Centre’s 55-seat catamaran and were soon speeding across the waves, with the boat seeming to leap into the air whenever a large wave hit the bow, causing a mix of laughter, happy screams and the occasional slightly grim face! Once in the calm waters around the Bass Rock, we were able to leave our seats and wander around the boat to find the best vantage point to watch thousands of gannets and a few eider ducks, kittiwakes and cormorants going about their daily business. The boat gets so close to the Bass Rock, at one point, I caught the eye of a curious gannet, who appeared to be people watching! As the boat sailed around the island, we were also able to study the lighthouse and the remains of the medieval castle which once guarded this island and, our very informative guide informed us, was a Covenanter’s prison in the 17th century. Next stop – Craigleith Island, where we were lucky enough to see puffins, hopping their way across the grass to their burrows. And then it was time to sail back to North Berwick where we stood on the beach and were able to say ‘We’ve been there’ as we pointed at the Bass Rock. This excellent boat trip takes about an hour and can be booked at the Scottish Seabird Centre.